After our morning drive, we went back, had lunch, charged our batteries and vegged out for a few hours. We considered doing an alternative activity besides a game drive, like go visit a Masai village, but it sounded so cheesy and demoralizing to the Masai. And from everything we heard, they of course would try to swindle you every opportunity they had, trying to sell like you crappy souvenirs or charging you $20 to take pictures. There were plenty of Masai, with their red robes, deformed earlobes and canes, loitering around our camp trying to sell you on a visit to their village. It was tempting, as their culture and attire looks interesting, but how can you "witness" this without contributing to their demise and commercialization/corruption? If you want to see what they look like, google them. We went back out in the afternoon, again with our trusty guide Simon. The British couple that we'd been with the first two drives moved on, and were replaced by an older British couple from Yorkshire. 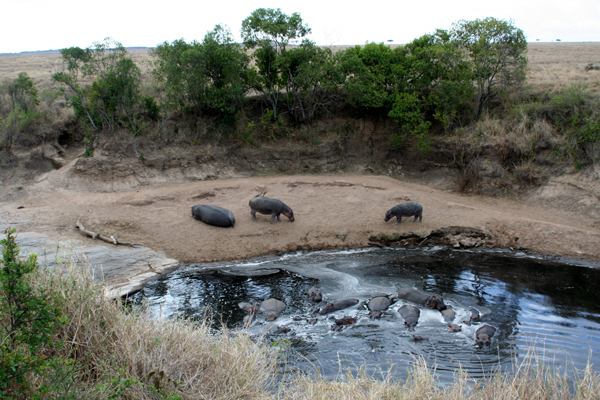 Despite being veterans to safaris, they had a lot of enthusiasm, especially to see hippos, which was our first stop. 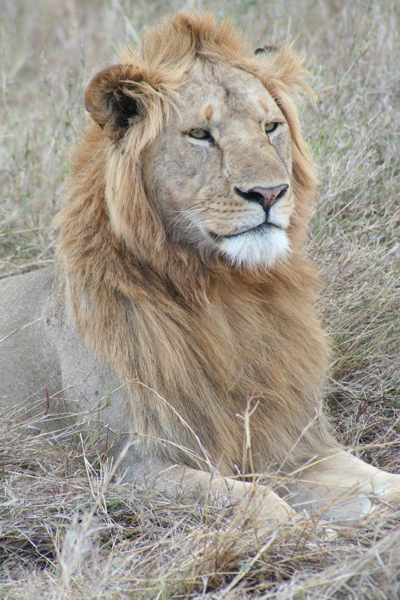 We had seen plenty of lions, but one thing we hadn't seen was a full grown male. This is what we came across next, and a rather handsome and healthy one at that. We headed on into new territory. I was hellbent on finding elephants, to the point where I think I was trying so hard to find them, that I willed them into sight. And then once we saw these, we of course came across more troops. That completed the big 5 for us, rhino, leopard, lions, buffalos and elephants. For what it's worth. That's more of a legacy big game hunter distinction, and there were plenty of other interesting animals to see. We wandered far off in a new direction seeing all sorts of things, but still no cheetah. It was getting to be dusk and past our time to get back, but Simon was as determined as I was on finding a cheetah, as a matter of pride. He saw something from like a kilometer a way. Something in the configuration of grazing gazelles and wildebeest, and which direction they were looking, set him off. 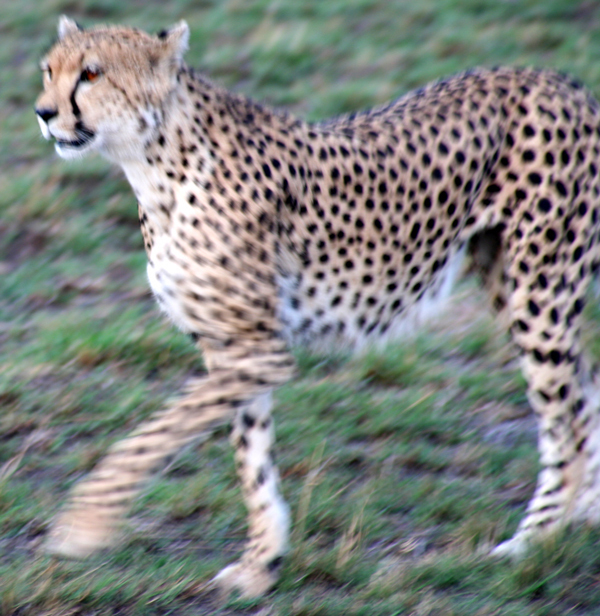 He drove off the road towards this hill, and sure enough, there at the base was our cheetah. 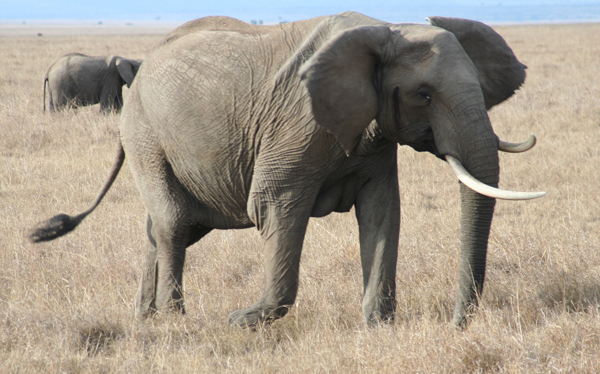 A mother with two youngsters in training. She was on a mission and completely ignored our presence, to the point where I thought she was going to walk right through our land cruiser without even looking at us. Now I really felt complete. She looked really healthy and well-fed, as did her rambunctious grown up cubs, which is reassuring to see. Back at the camp on the way to dinner, we almost got attacked by a hissing Genet cat that looked like a miniature leopard. It climbed into a tree to get away from us, then ran into a bush-baby which turned into an ugly spat.